The Grossmünster dominates the Zurich skyline and the Niederdorf. This church along with the Fraumunster are the main churches within Zurich. As well as being a place of worship it was also the centre of a religious revolution and is the city’s most famous landmark. The Grossmünster was founded by Charlemagne, whose horse according to legend, fell to its knees over the tombs of Felix and Regula, Zurich’s patron saints. Felix and Regula were members of an all-Christian Roman legion that was being executed in southern Switzerland. Fleeing with their servant Exuperantius they arrived in Zurich before being executed in 286 AD. So tradition has it, the governor plunged the three saints into boiling oil and forced them to drink molten lead. Refusing to renounce their faith they were eventually beheaded. The Wasserkirche stands on the site of their execution. However, they picked up their heads and walked the 40 paces to the hill which is the site of the Grossmünster where they dug their graves and buried themselves. The other famous church in Zurich, the Fraumünster, was founded by Charlemagne’s grandson, Louis the German. A key feature of the Grossmünster are the stained glass windows. In 2006 there was a competition to design the stained glass windows for the church and it was won by German artist Sigmar Polke. The project took 3 years to complete and the result was the seven windows in the western part of the nave being fitted with very modern designs created out of beautifully coloured sliced agate. The five windows to the east of the nave depict five figures from The Old Testament in stained glass. The beautiful stained-glass windows in the choir were made in 1933 by Augusto Giacometti, nephew of Alberto Giacometti, the famous Swiss abstract artist and the bronze doors are by Otto Münch. For a video about the Sigmar Polke windows see here. 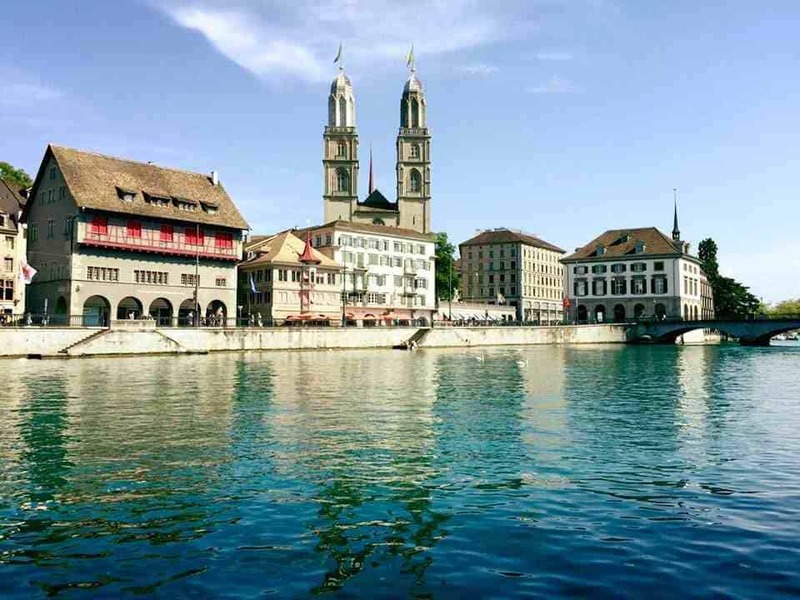 Not only is the Grossmünster a very interesting and beautiful historic church to visit, but you can also take the 187 steps to the top of the Karl Tower and get stunning views over the whole of the city.